AllegroMedical.com presents The DMI Mealtime Protector. The Mealtime Protector offers great protection from accidental spills. 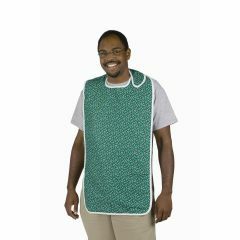 The Mealtime Protectors covers chest as well as lap areas providing maximum protection. Mealtime Protectors are also waterproof. Size: 17-3/4 in. x 36 in. Great I love these bibs for my mother. This is a sturdy bib and worth the cost. Mother loves the pink flower pattern, the good coverage and ease of putting the bib on. Also it folds into a neat small size. to stay clean and neat. I bought this for my husband who is doing most of the cooking now. He is a large man and most aprons are too small for him. I bought one of these to help keep his work clothes clean when he makes breakfast primarily. However it works anytime you want an apron and for the same reasons you would wear an apron! I just wish they were offered in more masculine designs. He was a little hesitant about wearing this around family at first as a result. Nevertheless, he loves it now! I ordered another one for Christmas this year in the green. It's a great product! Nothing has leaked onto the clothing underneath it. It also washes well. This works great! Kept clothes clean! Mom still likes to feel independent and this allowed her to eat her meals without having food stains on her clothing all day. Easy to use and easy to wash. Prevents accidental spills from staining clothing and are large enough to cover the entire lap area. What is this mealtime protector made of? What are the sizes--length and width? Gingham w/sturdy plastic behind and fits down to the knees. Very sturdy. The MealTime protector works very well. It is 17 inches wide and 28 inches long. It is waterproof even though the top looks like gingham and the underside (which is waterproof) looks like a nylon but does not feel like plastic. It is washable. My mother has lost most muscle control and liquids always partially run out the side of her mouth. This bib works really well. It has a large flap that goes around the neck and fastens via a piece of Velcro on the opposite side. I ordered this for a man because it said navy print and it was a floral print so beware. It is a very nice, sturdy bib. Cotton lined with plastic, with a velcro closure for the neck. I wouldn't say it goes to the knees. As shown it goes to below the waist. Covers well for someone in a wheelchair.